It’s 7:57 a.m. and Connor is standing with his backpack on at the living room window watching for his school bus at the end of our driveway. Starting today, a new driver is taking over Connor’s route and this is the exact time he said he’d be here. I peeked around the corner to make sure Connor was actually watching for the bus and not distracted with something else. Pleased to see my little man was in his spot, I headed back into the kitchen. “My bus is here!” he shouted. “Ho-ly smokes! That was quick! I just got back in the kitchen!” I said dramatically. I am a very teasy, jokey person and Connor has picked up on this. He too likes to tease, joke and have fun and he very often cracks himself up. This time he succeeded in getting me. He knew he would get some kind of reaction out of me by saying this almost as soon as I left the room. So as he was delighting in his own prank, I went back to loading the dishwasher (and had to chuckle at his silliness). 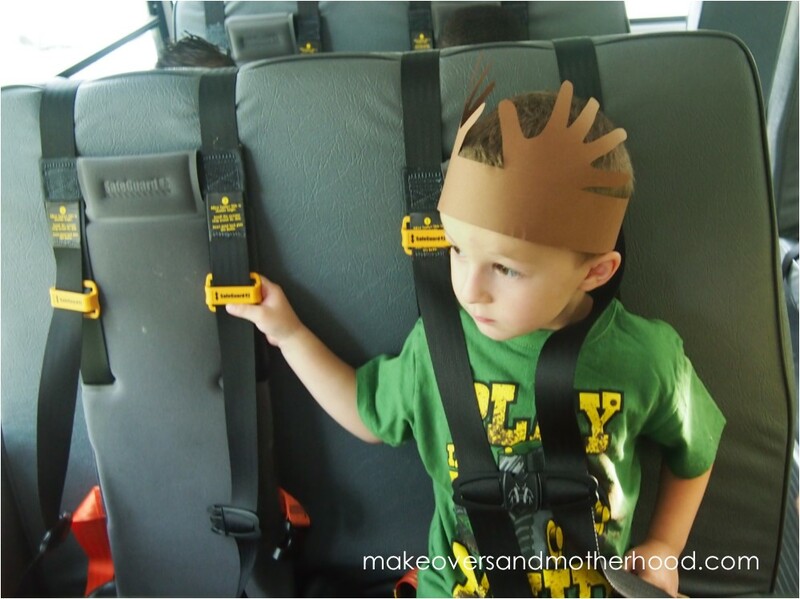 8:00… “My bus is here!” Connor shouted. “Ok,” I said putting a bowl back down on the countertop. I had to explain to Connor that while he got me once, it wasn’t funny this time. And I kept at my task. 8:04… “Mom, my bus is still not here.” Connor sounded a little disappointed and whiney. “He’ll be here soon. Just keep watching.” I assured him. 8:09… “It’s here! My bus is here!” Connor excitedly hollered and I knew that it really was here this time. There is just something magical about a school bus when you’re a kid. It’s more than the thrill of not showing up at school in mom’s minivan and having her kiss-all-over-your-face-telling-you-to-have-a-good-day-and-how-much-she’ll-miss-you in front of your friends. It’s a symbol of independence. It’s the small little green seats, sitting high above the other cars, and being surrounded by other anxious boys and girls your age. It’s the excitement of learning and going to school. Needless to say, when you’re little, waiting for the bus can feel like an eternity. It’s funny how even now as an adult with many waiting experiences, my reaction to waiting often mimics Connor’s. He went from waiting happily with anticipation to waiting anxiously to questioning to worrying. Now relate this to how you and I wait. 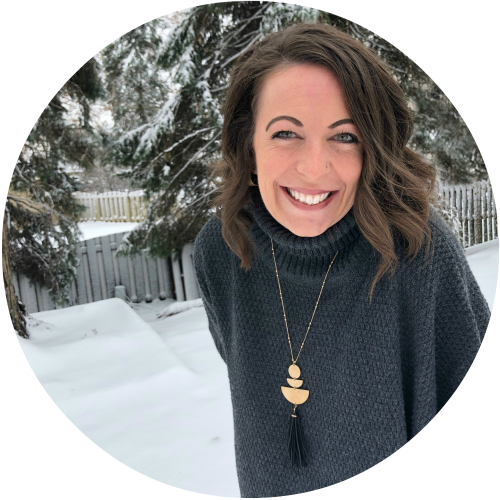 As we were prepared to move to the Chicagoland area for my husband’s job, we put an offer on a house in a southwest suburb that was a short sale. Putting the offer in was an exciting time. However, the month before we heard back from the seller’s bank seemed to drag on. “Brad, do you think they are going to accept our offer? Why is it taking so long?” Every communication we received from the bank took at least a month and none of their responses were in our favor. During the first few months of this process, I was going through Connor’s reaction wheel. Then I turned it over to God. All we could do was wait and my fretting about it was not going to solve anything. I needed to learn to wait on Him and rest in His peace while we waited for this house ordeal to work through. In the meantime, Brad got a raise and a promotion. So four months later when we found out the seller had applied for the wrong type of short sale and our offer was void, house hunting in our preferred suburb became an option. We were able to purchase a bigger home only 3.5 miles away from Brad’s work, in a better school district, with a huge backyard full of big trees and lots of privacy! It took Brad’s commute time from the would-be 37-minutes each way to a mere 10-minute door-to-door which meant we would have more family time with him. AND… little did we know another little person would be added to our family so the extra bedroom and finished basement came in extremely useful. It was definitely worth the wait. I really felt proud of myself learning to relax, leaning on God, and not carrying the burden of worry during the wait on myself. This lesson was more than worth the wait. It’s funny how quickly we forget the lesson we “learned” though. Give it time. Ugh… that patience thing again. When I was growing up and was irritated that things weren’t happening when I wanted them to, my mother would ask me, “What is the ‘P’ word?” I hated that ‘P’ word… patience. I didn’t have time for patience. I wanted it and I wanted it now. After all, that is what society tells us we deserve, right? We need to learn to be still and watch. Is there something we should be learning during the wait? What events are playing out in our lives that may affect the situation we are waiting on? Look for the blessings. We need to know there is someone we can run to when we need assurance and strength. Our spouse, friends, parents, and ultimately God. He tells us to submit our prayers and petitions to Him. As a child goes to his earthly father, our Heavenly Father wants us to run into his arms. Just as he wants to hear the desires of our heart, he also wants us to listen to His voice and follow the steering of his hand. Sometimes, our scenario may not play out as we want or expect. Sometimes we’ll have unanswered questions, broken hearts, painful situations. But sometimes we’ll have better, our prayers answered and our hearts overjoyed. Since we cannot see the big picture of our life, we can’t see how intricately all the pieces of our life fit together. But God can see it. So even if you do not get what you expect, be encouraged that you can always expect the best from Him (you just may not understand it right now). We need to remember that the events we are yearning for will (by God’s grace) happen, not in our own timing, but in His perfect timing. Friends, please know that when your little yellow bus rolls up to your house or whatever you are anxious for today comes to fruition, it will definitely be worth the wait. Waiting is always so hard! Thank you for linking this with my Sunday Sharing Pinterest Party! I hope you will come back this week and share some more great ideas! OMG….what a cutie pie he is. 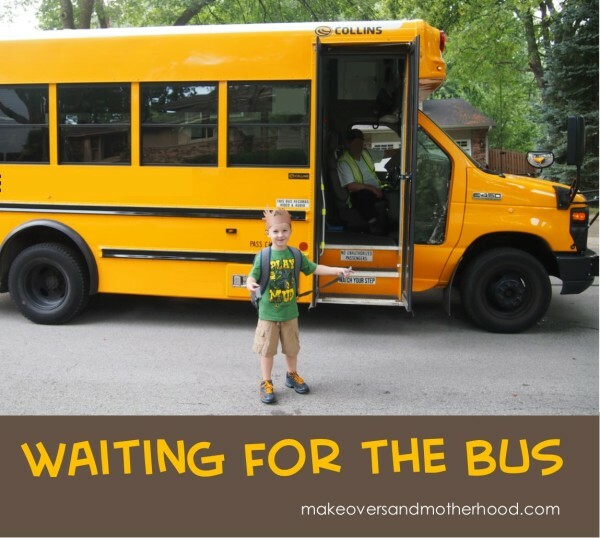 This post sure made me think and cry…one day my guy will ride the bus and I don’t know if I am ready…. 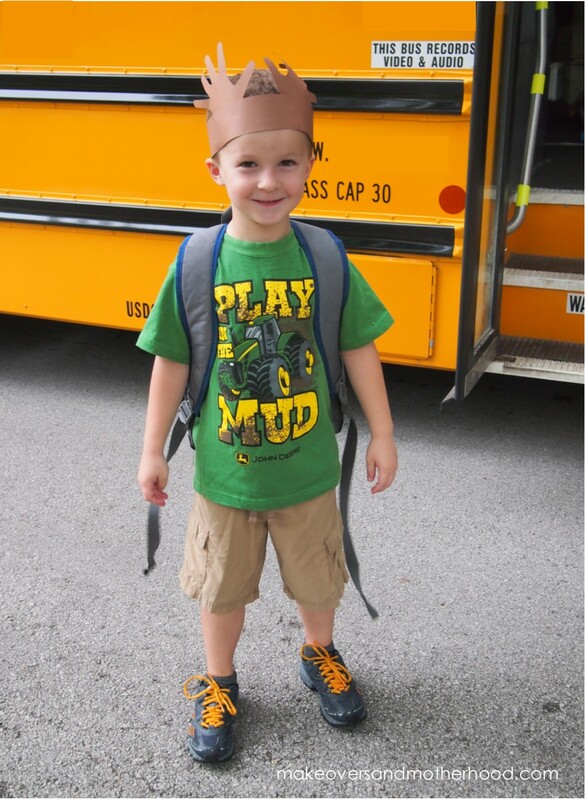 Watching my big boy get on the bus for the very first time was soooooo hard… especially at age 3 (which is when his phonology class started and bus service was offered to him). I chose that option because of having a little one who desperately needed nap time. Although having the bus service was so convenient and made my day so much easier, it was difficult letting him go. In other words, it was hard for me seeing him grow up so quickly. The big smiles that resulted from that bus ride were well worth it though. 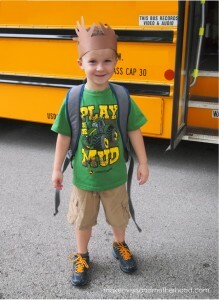 Even now, a year and a half later, he is still incredibly excited to ride the bus! Stay strong, momma! We all shed a tear at the end of the driveway (and in the house for another 10 minutes), but it makes that welcome home hug so much sweeter!